"Assassination remains rife in Vice City. Who is Mr. Black?" The PSG-1 in GTA Vice City. 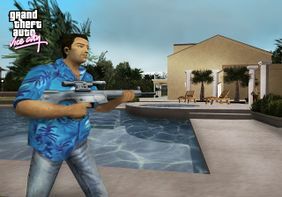 Tommy Vercetti wielding a Combat Sniper in a pre-release screenshot of Grand Theft Auto: Vice City. The PSG-1 is a semi-automatic sniper rifle based on the H&K G3 battle rifle. It is designed and manufactured by Heckler & Koch of Germany. In the GTA games, the PSG-1 is equipped with both a telescopic sight and a red laser point sight. The rifle has a seven bullet magazine, allowing for (brief) rapid firing, in contrast to the bolt-action mechanism of the regular Sniper Rifle. The HK SR9T rifle, a military variant of the PSG-1, was first featured in Grand Theft Auto: Vice City, and is also seen in Grand Theft Auto: Liberty City Stories. The rifle is labeled as the "PSG-1" only in the original PS2 version of Vice City; all other versions label it .308 Sniper, and it is labeled Laser Sighted Sniper Rifle in GTA Liberty City Stories. In Grand Theft Auto: Vice City Stories, the MSG90 is replaced by a Dragunov (SVD-1) to fit the game's setting of 1984. The PSG-1 (not an MSG90) in Grand Theft Auto IV is referenced in-game as the Combat Sniper. It has a ten-round magazine, and excellent range. The reticule used is not a standard mil-dot, but the graduated sight found on the Russian SVD Dragunov's PSO-1 scope. During first-person aiming, if the player is standing, there is a noticeable movement of the scope due to Niko Bellic's breathing. This can be minimized by crouching. The Combat Sniper rifle delivers a one-headshot kill in single player and multiplayer, unless the target is armored. It will also kill with about 3 shots to the body. It can easily take down drivers, motorcyclists and, with patience, helicopter pilots. In every Grand Theft Auto game in which this rifle has been featured in, the player can only fire the rifle in first-person mode. However, in the GTA IV Era, if the player is in cover, the player can fire it in third person mode using the crosshair provided. The rifle can also be blindfired. This is a very useful feature, as it can kill targets at a very far distance while staying safe behind cover and maintaining a clear view of the player's surrounds, therefore spotting potential targets to hide from or eliminate first. Downtown - Available to buy at Ammu-Nation after completion of Shakedown ($6,000). Little Havana - On the roof of a building by the Kaufman Cabs billboard directly east of Café Robina. Use the set of stairs behind this building to access. Availble at the Vercetti Estate, Hyman Condo and Ocean View Hotel after collecting 50 hidden packages. Fort Staunton, Staunton Island - On the balcony of a restaurant. It is easiest to acquire this weapon after the mission "Bringing the House Down" — due to the height of the balcony, it is very difficult to acquire this gun while the restaurant is still intact. The Combat Sniper can be purchased from the back-alley gun shops for $8,500 and each additional magazine will cost $500. It is also available from Little Jacob, Terry Thorpe in The Lost and Damned, and Armando Torres in The Ballad of Gay Tony for $5,000, with each additional magazine costing $500. It can also be acquired from certain LCPD officers attempting to snipe the player from rooftops in Chinatown and The Exchange. Hatton Gardens - Can be found atop the roof of the Civilization Committee building on Albany Ave, resting on the peak of the black dome. This roof also contains a unique stunt jump. Players are advised to acquire this rifle only as a last resort, since any entry onto the CC premises triggers a four-star wanted level. Acter - Can be found on the roof of an apartment complex off Aspdin Drive. A helicopter is required, as there is no roof access from the ground. Acter Industrial Park - Can be found atop another crude oil refining tower on Trinity Rd on the southwestern end of the Acter Industrial Park. The Combat Sniper's scope in action in Grand Theft Auto: Vice City. The Combat Sniper's scope in action in Grand Theft Auto IV. Toni Cipriani holding the Combat Sniper rifle in GTA Liberty City Stories. The Heckler & Koch SR9(T) seen in GTA Vice City and GTA LCS. An actual H&K PSG-1 seen in the GTA IV era. This page was last modified on 21 December 2012, at 05:14.